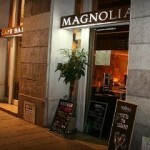 Magnolia is an international restaurant in Barcelona, which means that you can take a little break if you have had to much seafood and paellas! 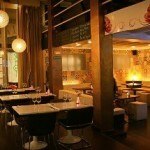 It is located in the heart of the Gótico quarter in Barcelona, not far from the metro stop Jaume I. In the restaurant sport events are sometimes broadcasted, so if you are lucky you can see your favorite football team play while eating some tapas, or while tasting one of the many good cocktails available in the restaurant.